Description of decorations: Gray sand of various sizes, looking more natural, representing dust and sand in the Taiwanee Reef region. 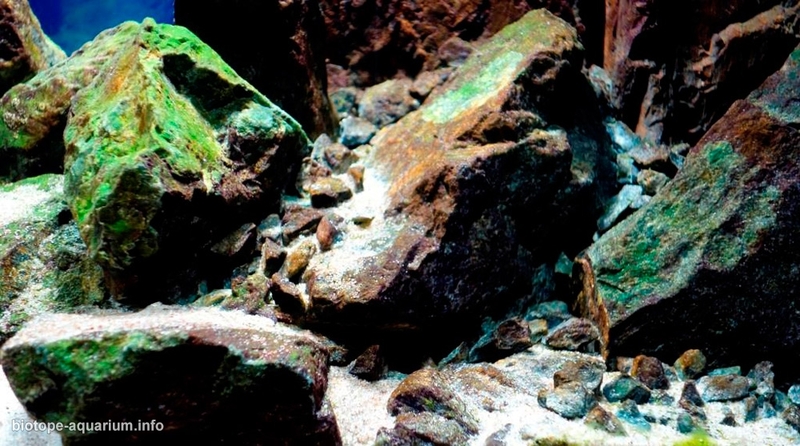 Rocks, irregular. Serpentinite representing a rocky region that changes into the region of the Chizumulu island. Description of equipment: external filtration: mechanical HW-603 and biological Aquael Unimax 250. Wave pump: Sicce XSTREAM – E with Controller 3000-8500 L/H. Light: 2x LED Aquael Sunny 6w. Water parameters: Temperature is 26°C, pH is 8,0, KH is 8, GH is 5. Description of the area surrounding the biotope: Lake Malawi is an African Great Lake located between Malawi, Mozambique and Tanzania. It is the ninth largest lake in the world and the third largest and second deepest lake in Africa. It is home to more species of fish than any other lake, including at least 700 species of cichlids. The Mozambique portion of the lake was officially declared a reserve by the Government of Mozambique on June 10, 2011, while in Malawi a portion of the lake is included in Lake Malawi National Park. Lake Malawi is a meromictic lake, meaning that its water layers do not mix. The permanent stratification of Lake Malawi’s water and the oxic-anoxic boundary (relating to oxygen in the water) are maintained by moderately small chemical and thermal gradients. Lake Malawi is between 560 and 580 kilometres long, and about 75 kilometres wide at its widest point. The lake has a total surface area of about 29,600 square kilometres. The lake is 706 m at its deepest point, located in a major depression in the north-central part. The southern half of the lake is shallower; less than 400 m in the south-central part and less than 200 m in the far south. The lake has shorelines on western Mozambique, eastern Malawi, and southern Tanzania. The largest river flowing into it is the Ruhuhu River, and there is an outlet at its southern end, the Shire River, a tributary that flows into the very large Zambezi River in Mozambique. Evaporation accounts for more than 80% of the water loss from the lake, considerably more than the outflowing Shire River. 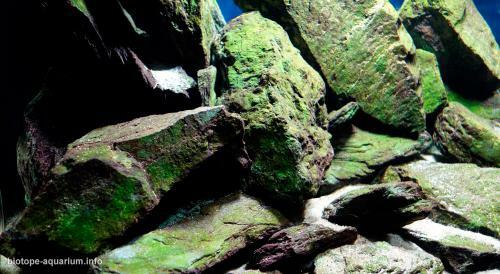 Description of the underwater landscape of the biotope: Lake Malawi in the Taiwanee Reef region is a typically rocky area. There is not too much sand there. What looks like sand is mostly crushed rock to a fine dust. 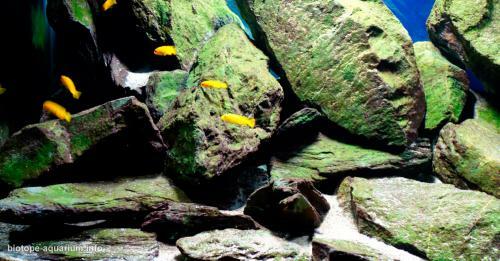 Rocks are massive and in the gaps between them or under them live fish. Description of the parameters of the habitat: The lake’s water is alkaline (pH 7.7—8.6) and warm with a typical surface temperature between 24 and 29 °C, while deep sections typically are about 22 °C. The thermocline is located at a depth of 40–100 m. The oxygen limit is at a depth of approximately 250 m, effectively restricting fish and other aerobic organisms to the upper part. The water is very clear for a lake and the visibility can be up to 20 m, but slightly less than half this figure is more common and it is below 3 m in muddy bays. List of fishes and invertebrates occurring in the nature biotope: Chindongo Saulosi, Protomelas sp. Steveni Taiwan. 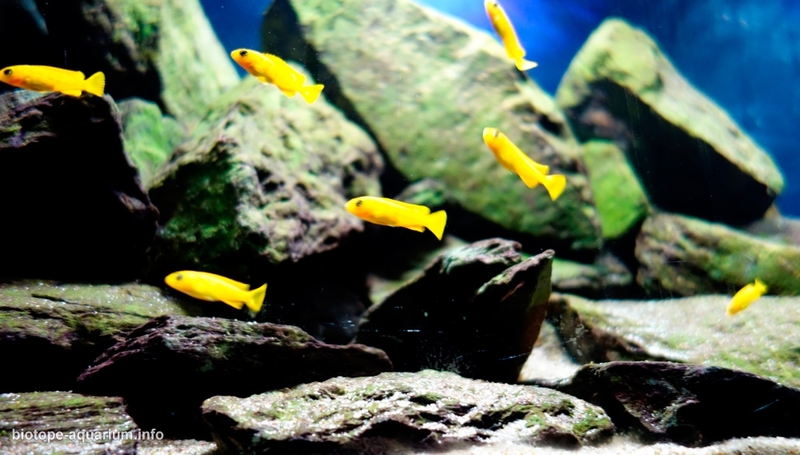 Threats to the ecology: Pseudotropheus Saulosi is a fish that arouses great interest because it is less and less in nature. Thanks to the activities of Stuart M. Grant this species is restored to the lake. In nature is almost unheard of. By this the species loses on its genetic pattern. It’s hard to meet the model gene. That’s why this species interested me so much and I decided to find the right class of fish and create the perfect natural conditions for them. Thanks to this we can stop people from catching the rest of the fish from this species and stick to the gene pattern in aquarium conditions.